With an elegant shift silhouette and flattering round neckline, this dress by Marina Rinaldi will elevate your outfit at your next special occasion. 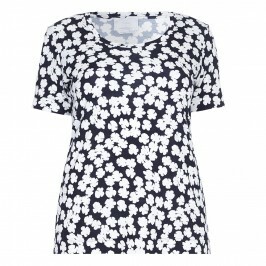 Crafted from stretch cotton and printed with an all over floral design, this style features side pockets and includes the option to add short sleeves. Complete the look with a simple pair of heels for fashionable, feminine style. 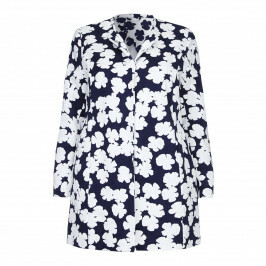 Marina Rinaldi navy abstract floral print dress with optional short sleeves and separate lining. 98% Cotton, 2% Elastane. Cool Machine Wash or Delicate Dry Clean.